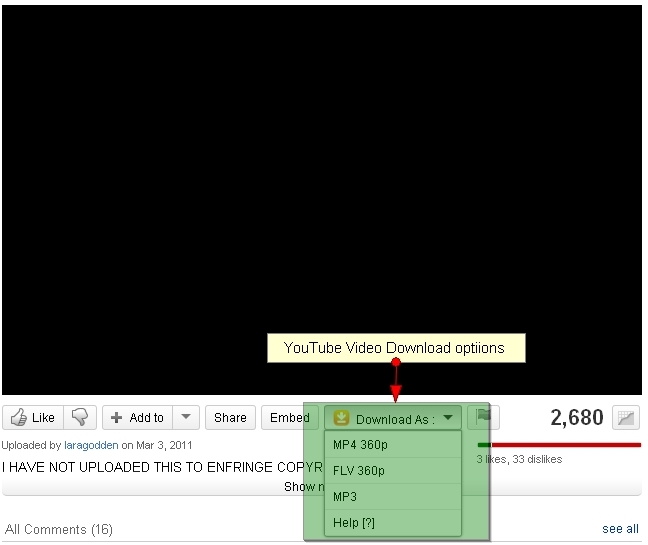 There are so many options to download youtube video i.e. browser add-ons, online software and tools, freeware software, temp file, real player etc but here i will discuss easiest way to download youtube video through browser add-ons. If you are using firefox browser, just download Easy YouTube Video Downloader 3.6 firefox add-ons and follow further instructions to download it for your browser. Now restart your browser and go to youtube.com, open any video then you will find Download as option just below of the video. Here you will get options to download video into different format i.e. FLA, 3GP, MP4, HD, MP3. Just click one of them and download it in your system. (Recommend click on HD option). This is the easiest way to download any youtube video because Download as option will appear on all the youtube video pages. You don’t need to go any where while trying to download any video from this firefox add-ons. There are so many freeware software to download youtube video. Just google it i.e. youtube downloader. You need to download particular software for it. If you have real player in you system, put your mouse cursor on the youtube video then download option will appear, click on it and download will start.